By Horsewoman from Yelm, WA. and washable ultrasuede. One size fits most saddles. Please Note: The saddle pictured above is not included! 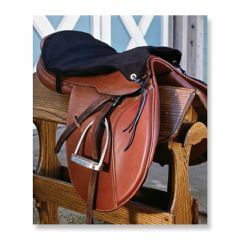 I used this saddle seat saver on a two day trail ride. I could not have made the trip without it! It made my hard saddle 100% more comfortable! Very Spendy. Only comes in Black. Horse back riding. Bike riding. Equine driving. Car driving. trail rider. Equine camper. Retired Senior. I use it when I'm trail riding and fell in love with it the first time I used it, it stays in place on the saddle seat and doesn't get hot or make you sweat on hottest of days. It helps relieve back and leg pain while riding for hours on the trail, yes it's more expensive than other types of seat savers I've used but well worth the investment in my behind and back. Very comfortable. stays put on the saddle. only one I will own. English or Western. Great for trail riding. This is my second Supracore pad and I won't own another. The first lasted about 11 yrs but the ultra suede does wear out after time. I just flipped it upside down then and used it. I ride between 8 and 18 miles on a typical trial ride so it gets a lot of use. My daughter hurt her tail bone and I gave her my old one to sit on while at home and driving and she loves it too. Have recommended this pad to many friends who also love it.